DMEK is a partial-thickness cornea transplant procedure that involves selective removal of the patient's Descemet membrane and endothelium, followed by transplantation of donor corneal endothelium and Descemet membrane without additional stromal tissue from the donor. The graft tissue is merely 10-15 microns thick. Similar to DSAEK, direct contact with the DMEK graft tissue should be avoided to prevent endothelial cell damage and graft failure. A clear corneal incision is created, the recipient endothelium and Descemet membrane are removed, and the graft is loaded into an inserter. 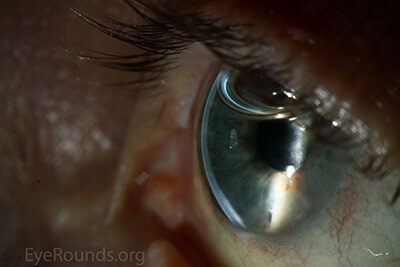 After injecting the tissue into the anterior chamber, the surgeon orients and unscrolls the graft, and a bubble of 20% sulfur hexafluoride (SF6) is placed in the anterior chamber to support graft adherence (Figure 10). A variation known as Descemet membrane automated endothelial keratoplasty (DMAEK) utilized an automated preparation of the donor tissue that left a rim of donor stroma peripherally for easier tissue handling (Figure 11), but the procedure is no longer performed due to advances in DMEK that have allowed for easier insertion and manipulation of the graft tissue. Figure 10: (A, B) Anterior chamber gas bubbles in 2 different patients each 1 week after DMEK for Fuchs dystrophy. (C) A third patient demonstrating complete resorption of the gas bubble 2 weeks after the operation. Figure 11: Post-operative appearance 1 month after DMAEK. 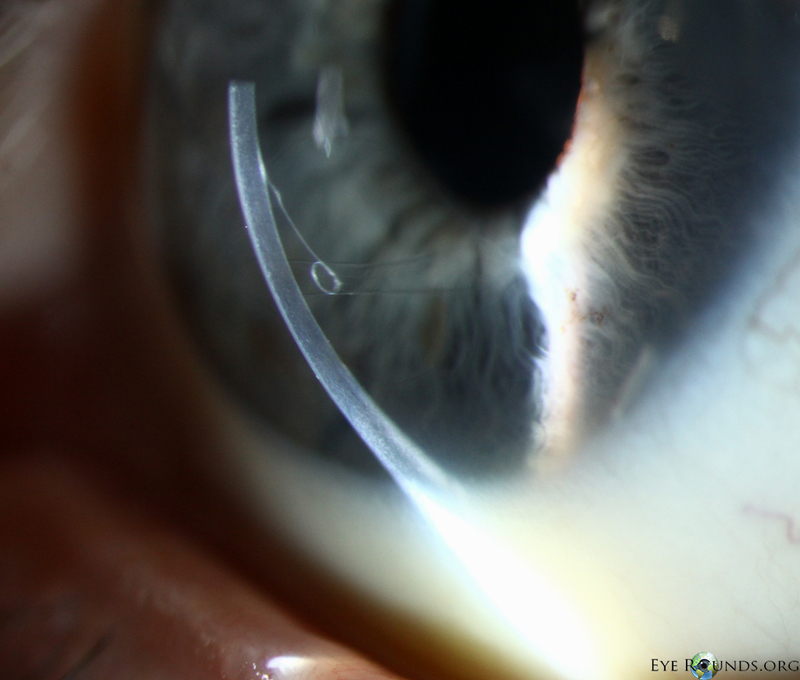 The indications for DMEK are similar to those for DSAEK, including endothelial dystrophies (such as Fuchs corneal dystrophy and posterior polymorphous corneal dystrophy), pseudophakic bullous keratopathy, ICE syndrome, and other causes of corneal endothelial dysfunction (1, 10, 17). DMEK offers the most rapid visual rehabilitation of any keratoplasty technique to date (Figure 12). Final visual acuity can be outstanding due to minimal optical interface effects. Because less tissue is transplanted, there is a lower risk of allograft rejection and less long-term reliance on topical steroids compared with other types of keratoplasty. Discontinuation of topical steroids can be considered at or before 1 year after the procedure, especially for patients with elevated intraocular pressure. Figure 12: Clear cornea with 20/20 acuity 1 month after DMEK for Fuchs dystrophy. Because of thinness, fragility, and its characteristic scrolling properties (with the endothelium facing outward), the donor tissue can be difficult to handle and contribute to technical difficulties with the procedure. There is a higher risk of graft edge lifts (Figure 13) compared with DSAEK, sometimes requiring a re-bubble procedure. Figure 13: Chronic inferior edge lift of a DMEK graft. Notice the scrolling of the edge toward the stroma, indicating correct graft orientation, and the absence of stromal edema. Figure 14: Anterior segment optical coherence tomography demonstrating a limited, peripheral graft edge lift one week after DMEK surgery (right side of image). The attached portion of the graft mimics normal anatomy due to the precise 1-to-1 replacement of tissue with DMEK. Create two to four paracentesis sites. Fill the anterior chamber with Healon. Create an inferior peripheral iridotomy using a bent 30-gauge needle and Sinskey hook to prevent post-operative pupillary block. 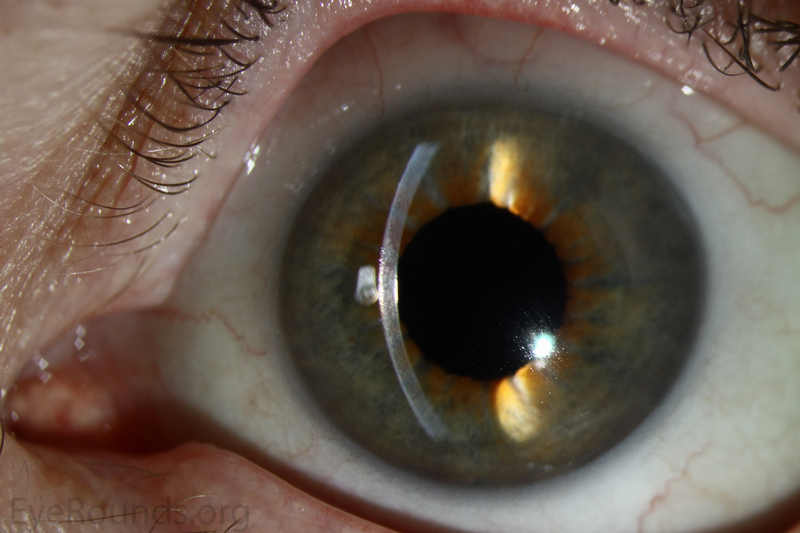 Mark the recipient's corneal epithelium with a circular ring slightly larger than the planned graft diameter to create a template for resection of the host tissue. Score Descemet membrane peripherally using a reverse Terry-Sinskey hook, then peel Descemet membrane from the overlying stroma. Create an incision temporally using a keratome, then remove the free Descemet membrane using forceps. Remove the Healon using the irrigation/aspiration handpiece. 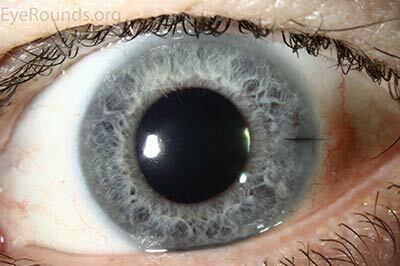 Inject Miochol to constrict the pupil and BSS to normalize the pressure. Carefully lift the donor tissue by grasping the outermost edge with tying forceps and submerge it in trypan blue solution for 60 seconds to stain the tissue and make it more visible. Place the tissue in a BSS-filled petri dish and it will scroll spontaneously. Aspirate it into a modified glass Jones tube. Insert the tip of the glass tube into the clear corneal incision and inject the donor tissue into the anterior chamber. 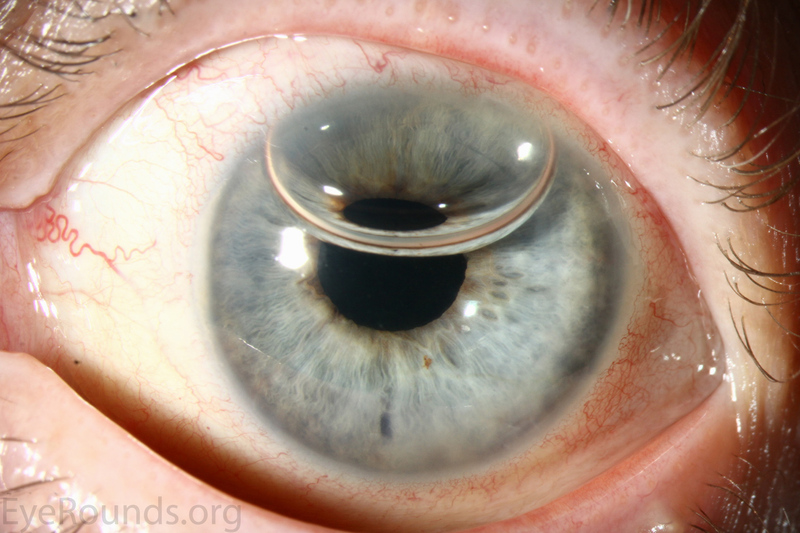 Release fluid from a paracentesis to flatten the anterior chamber. Gently tap and swipe on the anterior corneal surface until the graft is appropriately positioned and unscrolled. Inject 20% SF6 into the anterior chamber to secure the graft and wait 10-15 minutes for adhesion. Close the main incision with a 10-0 nylon suture. 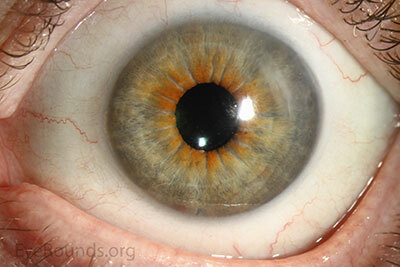 Perform an air-fluid exchange to ensure there is no gas trapped behind the iris and assess for graft adhesion. Injection another bubble of 20% SF6 to cover the graft, about 80-90% of the anterior chamber. Descemet Membrane Endothelial Keratoplasty (DMEK) for Fuchs Endothelial Dystrophy.